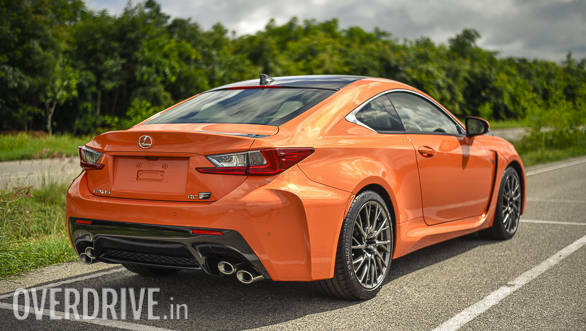 The Lexus RC F has been around for over three years now and like most things Lexus, it has taken quite a while to breathe the air in India. I met up with one example that has been acclimatising to the lovely weather in Bangalore for a few months now. Sitting proudly as an exclusive import, overlooking waves of Innovas and Fortuners rolling out from Toyota's plant in the industrial district of Bidadi, the RC F was waiting to be driven hard. 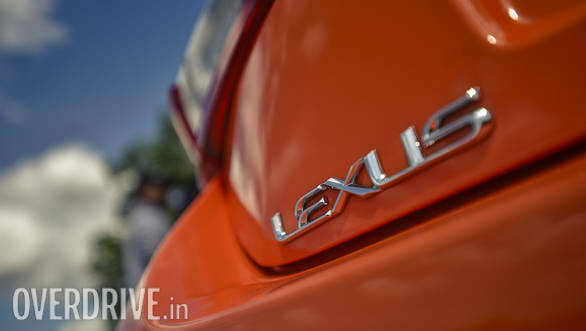 Lexus agreed to let me do the honours and even opened the gates to Toyota's private test track at the plant. They politely told me that the test track has certain speed limits to maintain the surface quality - something they are very sensitive about since all their cars run on this track for their final quality check and validation. The track is made up of a long straight with a banked right-hander hairpin at either end. The speed limit for the straight is 140kmph. Toyota had also placed five cones on the straight for a quick slalom course. Alongside the straight is a braking zone and I was told that this was the only section of the track where I was allowed to go hard on the brakes. Adjacent to the test track are other test beds that simulate ruts, joints, undulated surfaces and speed humps of varied sizes. 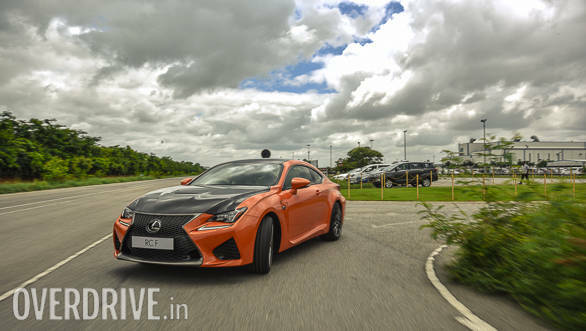 I had half a day with the RC F and this track, and using any more time than that would have meant that certain customers awaiting delivery of their Innova or Fortuner would have to defer their celebrations by a day or two. I had no option but to agree to these demands. Keep looking at her for some time and you will understand why I gave in so easily. She isn't the prettiest sportscar around, but the RC F looks smart and has an air of sophistication that is typical to the Lexus family. Lexus doesn't build sportscars as often as the AMG, M or Audi Sport divisions of its German rivals do, but the Japanese carmaker isn't new to tuning culture either. The RC F expresses all of it quite nicely. The letter 'F' is the equivalent of performance in the Lexus portfolio, and we got the first taste of it with the RX crossover's F Sport trim. On this sportscar though, the F moniker dials up the performance quotient to a different level altogether. The RC F is based on the RC 2+2 coupe. It borrows bits from the legendary LFA, plonks in a more powerful engine, and adds the necessary supplements to the bodywork to make the surface more slippery and help the engine breathe better. With a drag coefficient of 0.33cd though, it isn't as aerodynamic as it looks. But if looks could kill, the RC F could slice right through you and it has plenty of sharp edges to do just that. 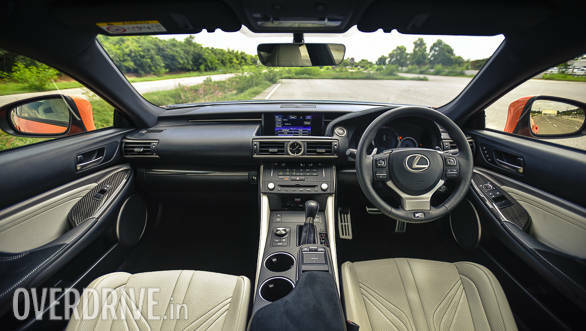 The outrageous spindle grille takes centre stage and though it looks out of place on some of the other Lexus models, it fits right in with all the angular cuts, pinched creases and the domed hood of the RC F. The F Sport signature mesh design on the grille looks quite smart too. There are air ducts at the lower corners of the grille and two big air dams flanking it in the bumper. I particularly like the headlamps with its three-pot layout and a crystalline design for the LED lens. The daytime running lamps that underline the headlights look quirky and, in turn, quite distinctive. Move to the side and you will notice more crevices! 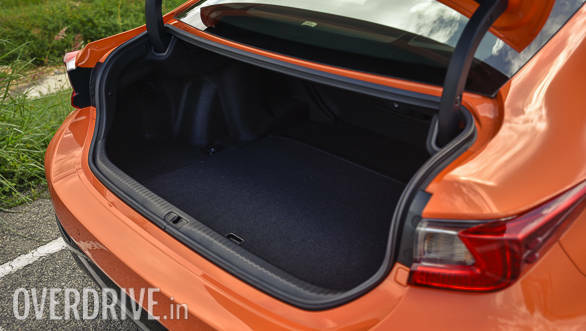 There is an air duct behind the front wheel arch which creates a leading edge at the top for a sharp shoulder line, while the bottom end of the channel flows cleanly into the rocker panel. This in turn makes flared wheels arches and the rocker panel jut out quite a bit, giving the door a negative offset. The result is that the light and shadow surfaces have a clear definition, and the RC F doesn't look as busy as its bodywork would otherwise suggest. The tail looks quite funky. 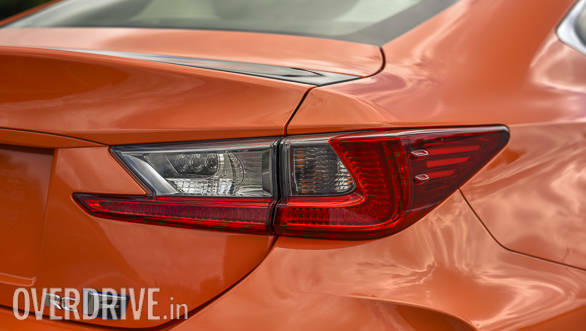 While the shape and detailing of tail lights is pretty average compared to the rest of the car, the angled exhaust pipes - four of them - attract attention. The two-tone bumper looks good, but is set quite high for a sportscar. To me, the overall proportions and the outrageous design elements give the RC F far more character than the M4 or the RS 5 that it rivals. Or maybe I just have a soft corner for the Japs and their anime-inspired cars. The model that I got my hands on had the roof, the hood and the automatically retracting wing spoiler crafted out of carbon fibre and finished in high gloss. It's a part of the option list and when coupled with pearlescent colours, it has a tuner-car vibe to it. You also get a hood scoop that comes straight out of the LFA. What I also like are the 19-inch wheels with an optional 10-spoke split-end design. 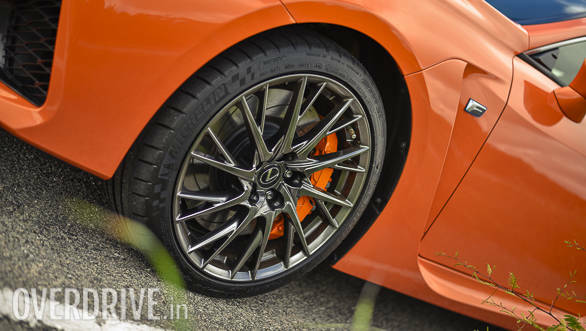 These are given a glossy gunmetal finish that matches that of the spindle grille. If I had to go nitpicking, I would have liked to see a similar gunmetal finish on the window lining too - and not the boring old chrome that clearly looks out of place. I would have also liked the optional carbon-fibre pack to include the diffuser to maintain uniformity of colours and textures. 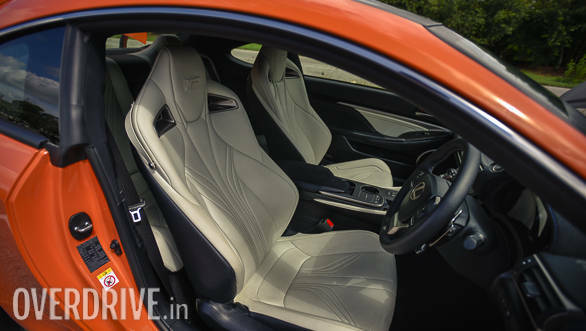 The carbon fibre also finds its way inside the cabin to create some tastefully crafted inlays. The layout of the dashboard fascia and the switchgear is quite simple and easy to understand. I don't quite like the haptic touchpad for controlling the infotainment and would prefer the German rotary dials instead. But what I like is the fit and finish of the components and the matte-finished touch panel for the AC controls. Feels novel and premium. You get two cupholders which can also hold 1l bottles without compromising ergonomics. The door pads are only good for slim objects like a folder or a tablet computer. 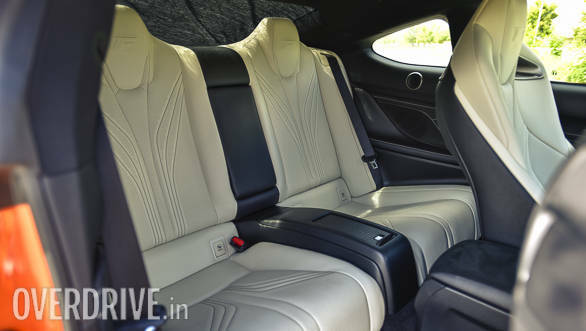 The front seats are nicely bolstered to hold you in place around fast switchbacks and these, along with the steering, are electrically adjustable. There are two average-sized seats at the back for two kids or short adults. As with any low-riding coupe, ingress and egress isn't as easy as a sedan, making the M4 or the RS 5 feel more practical in that sense. Thumb the starter and the 5.0l V8 comes to life with a rumble and settles into a relatively silent idle. There is a bit of lag when it gets off the mark, beyond which it climbs up the rev range quite cleanly. 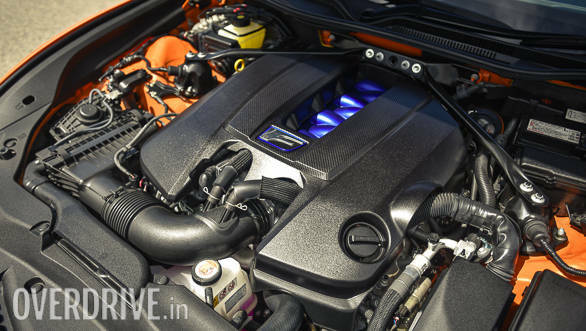 The engine remains quite silent and sober till about 4,000rpm, beyond which the camshafts will change timing, the intake flaps will open and the engine will awaken with a true V8 aura. It easily shuns the M4's orchestrated sounds and comes very close to the RS 5's roar. Power delivery is typically linear and the meat lies between 5,000-7,300rpm redline. 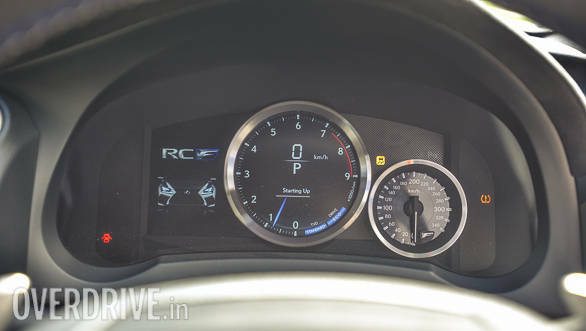 RC F will race through the rev-range quite briskly and will hit the ton from standstill in about 4.6s! The beauty of the motor is how it can manage to be a well-mannered pet at lower revs and a monster when you push the pedal further in. What goes against it though is its heavy build. The RC F borrows its front and rear from a performance sedan, while the passenger cell comes from a convertible. The hybrid construction gives it a stiff core and a more harmonious body balance, but it also tips the scales over 1.8 tonnes. It has its implications on outright performance and braking. Discs larger than a large pizza cut speed without fade, but they take a while to do it and feel quite wooden too. So if you are looking for a track tool or a drag racer, the M4 easily wins the battle. Where the RC F shines though is on the road. It has a supple ride that is better than the RS 5 and something that the M4 can only dream of, while the rigid chassis gives it better precision and point and shoot dynamics than the RS 5. 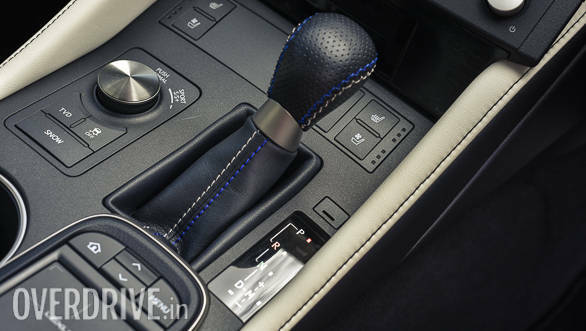 The 8-speed transmission is quick and predictable too. The icing on the cake, however, is the optional torque vectoring differential (TVD). Unfortunately, it adds even more weight, but completely changes the dynamics. It has three modes to choose from - Normal, Track and Slalom. Yes, the Japs love cones and going around them, but the Slalom mode is more than just autocross love - it's about mountain roads. When you are gunning around switchbacks and on throttle, the TVD will keep shuttling torque between the rear wheels to mitigate understeer. In fact, the harder you push, the more agile the car feels - a welcome trait for drivers of all skill levels. The RC F may not like the track after all, but at touge racing it could annihilate the competition. 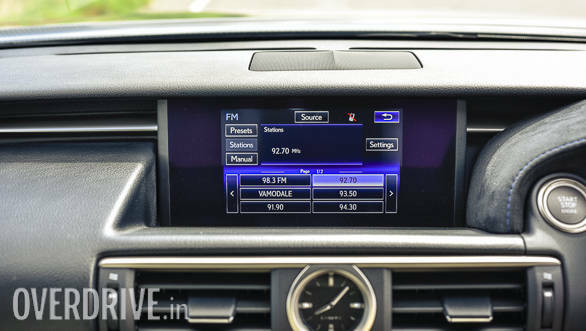 Independent of the TVD, the computers also let you choose between driving modes like Eco, Normal, Sport and Sport+. The modes are self-explanatory and will alter throttle response and transmission logic to match the dialled intent. The steering, however, has only two settings - Normal (in Eco/Normal) and Sport (in Sport/Sport+), with the latter gaining weight but making no difference to the feedback. The suspension isn't the adaptive kind and remains unchanged too. But out of the box, it achieves a nice balance between a comfortable ride and dynamics. 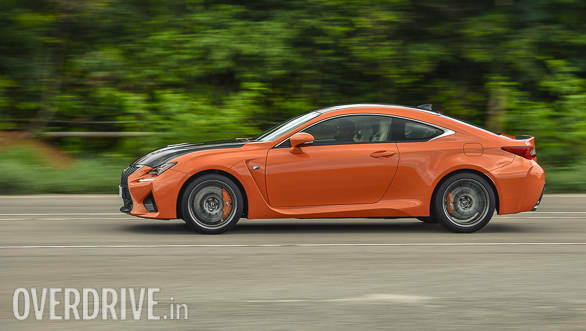 Potholed roads won't be kind to the RC F, but the car isn't difficult to live with even in India. A go on the rumble strips and the tall speed humps on the test track back my claim. Can you buy one in India, though? Well, here's the dampener. Contrary to reports floating on the internet (we are guilty of it too), the RC F hasn't been launched in India officially. But certain import regulations that revolve around the Whole Vehicle Type Approval (WVTA) allow the carmaker to import limited units of the RC F. So if you badly want one, you could say please to Lexus and they may be in a position to oblige. It could be worth the effort, if you are looking for an exclusive alternative to the likes of the M4, the RS 5 and the one that is seriously quick and practical for everyday use and weekend fun.